In a food processor or large bowl, whiz together flour and salt. Cut in the shortening or butter by pulsing or using a pastry blender or fork the mixture resembles small peas. Sprinkle with 1 tablespoon cold water at a time, mixing and adding more water, as necessary, until the dough can be gathered. Wrap in plastic and refrigerate while you prepare the apples. Heat oven to 425 degrees F. Rub lemon juice on the outside of each peeled and cored apple and set aside. In a small bowl, mix raisins and nuts and set aside. Remove pastry crust from refrigerator. Sprinkle a work surface lightly with flour. Roll dough to 1/4-inch thickness and cut 6 (3 1/2-inch) squares. Place 1 apple on each of the squares. Fill the center of each apple with reserved raisin-nut mixture. Dab the corners of the pastry squares with a small amount of water or egg white. Bring two opposite corners of dough up over the apple without tearing the dough and press together. Repeat with the remaining corners until apple is fully encased. If desired, use pastry dough scraps to make small leaves and adhere to top of apple with a dab of water or egg white. Place apple dumplings in a 13x9-inch baking dish (preferably glass so you can see when the bottom is fully baked) and refrigerate while you make the sugar syrup. In a small saucepan, heat the light brown sugar and 1 1/3 cups water until it comes to a boil, stirring frequently. Remove dumplings from refrigerator and pour the sugar water in the pan around the dumplings carefully so they don't topple over. Place in oven and bake about 40 minutes, spooning syrup over apples at least twice until crust is browned and apples are tender when pierced with a thin-bladed knife (not a butter knife). Remove from oven. Serve warm with pan syrup or custard sauce (see below) or garnish with vanilla ice cream, cinnamon ice cream, or whipped heavy cream. Heat half-and-half in a heavy-bottomed saucepan until bubbles form around the edges. While half-and-half is heating, in a medium heatproof bowl, whisk together egg yolks and 4 ounces sugar until they are pale yellow and have thickened to the ribbon stage. Add cornstarch and vanilla, whisking until smooth. In a steady, slow stream, pour heated half-and-half into the egg mixture, whisking constantly. Return the mixture to the saucepan and heat over low, whisking constantly, until the custard coats the back of a spoon. Remove from heat and, if lumps are present, strain into a heatproof bowl. Serve warm or cold. Can be held for two weeks, tightly covered, in the refrigerator. Instead of using pastry dough to encase the apples, try homemade or purchased puff pastry or phyllo dough. 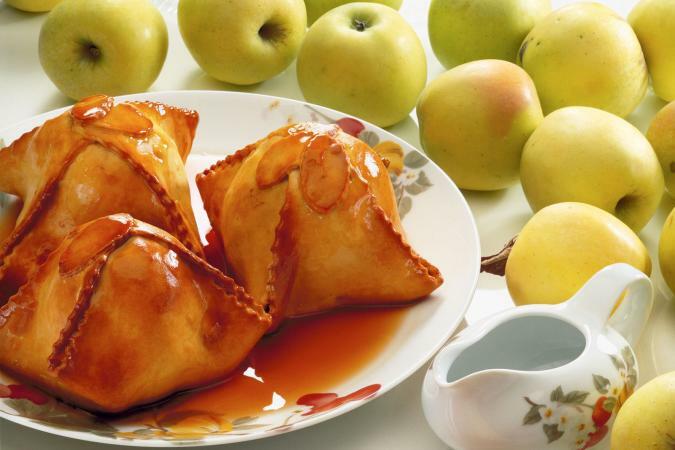 If wheat is a problem, try a gluten-free apple dumpling recipe.